The Case Yellowhorse knives with Damascus steel blades use familiar Case knife types as a starting point. Knowledgeable Case knife owners will recognize styles like the Case Stockman and Case Trapper. These special creations add the traditional patterns and hand-craftsmanship for which the individual artisans of the Yellowhorse family are now famous. These Damascus pocket knives created by Ron Yellowhorse begin with the basic Case pocket knife structure, but it's all Navajo after that. Instead of polished nickel steel bolsters, for instance, these knives feature hand-worked hammered nickel steel bolsters which accent the rippled metal of the Damascus steel blades. Blade styles are the same you'd get in the common Case pattern -- clip, spey, and sheepsfoot in the Stockman versions and clip and spey blades in the Trapper. Case is already well-known for unusual handle materials, but Ron Yellowhorse used different types of turquoise, black jet, a purple mineral called suglite, and slabs cut from fossil mammoth teeth in the grips of these beautiful knives. 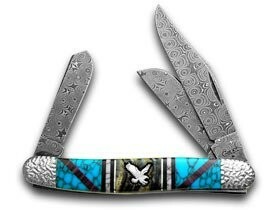 Shields on each knife represent a different bird or animal important to Native American culture. Pick one you like, and don't wait too long. Only one knife of each pattern will be produced. For another limited run collectible, see the Victorinox Heritage Limited Edition knife -- a recreation of the first Swiss Army Knife ever manufactured.